Intro: The Bible teaches about a place called Hell. It has become a swear word, a joke, a byword in today’s language. I stand before you this morning on the authority of the Bible and I declare unto you that Hell is a real place, and it is a horrible place. Jesus preached about Hell more than He did about Heaven. Jesus came to seek and to save that which was lost. Save them from what? From sin, no doubt, but he came to save mankind from the horrors of Hell. God sent his holy begotten Son that whosoever believeth in him should not perish – perish how? Perish in the horrors of Hell. Here at Calvary Baptist Church, we strongly believe in the Biblical account of a place called Hell. It is one of our primary motivations for much of what we do around here. We ran busses this morning to keep children and people from every knowing the Horrors of Hell. We have a preacher preaching Junior Church this morning next door to keep people out of Hell. We give an altar call or an invitation every single service here to keep people from going to Hell. We have missionaries come through all the time, presenting their work to help keep people out of Hell. We support over 80 different missionary projects around the world to keep people from going to Hell. We spend thousands of dollars each year on gospel tracts and outreach cards to keep people from going to Hell. We go soulwinning, door-knocking to spread the message of the Gospel to keep people from ever ending up in Hell. This month, we will have a Public Servant’s Appreciation Day September 9th to warn our heroes of this place called Hell. We will have Beast Feast on the 15th and a Ladies Extravaganza on the 22nd to try and keep people out of Hell. Hell was not created for man. That was never God’s plan. 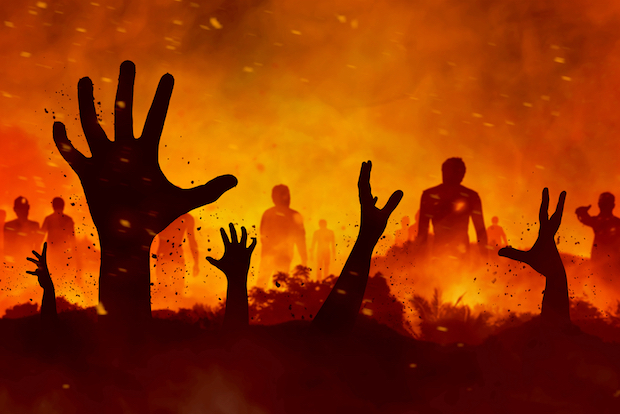 God prepared Hell as the final punishment for Satan and the devils that rebelled against Him. He cast them out of Heaven with the plan to one day cast them into hell. Hell is a horrible place because it is a place of fire and brimstone. For those men that laugh at the thought of hell and say things like, “We will just have big weenie roast in Hell with all my friends.” I have never met a firefighter that kicked in the door of a burning house with a man and his family inside and after screaming “Your house is on fire!” have the man go to the refrigerator and take out a pack of hot dogs and start roasting them over the flames! Hell is a horrible place because Hell is a place of fire. I’ve heard of men mocking Hell and making jokes about going to Hell with all their friends. Hell is no laughing matter! The Bible is clear; Hell is a place of fire and outer darkness. There will be no light in Hell. But Hell is described multiple times in the Scripture as a place of OUTER DARKNESS. People will be screaming and chewing on each other. Hell is a place of fire, worms, darkness, screaming, biting. Hell is a place of fear. Hell is a dreadful place; a horrible place. There is nothing you can do to change your circumstances. Prayer doesn’t work in Hell. The rich man in Luke 16 prayed to no avail. He begged for water and got none. He begged for mercy and got none. He begged for relief and got none. He begged for Lazarus to go witness to his brothers and didn’t get it. There will be no one there to care. Memories of Scripture will not help. Messages and Bible verses that you heard and memorized will not help. You can cry, and scream, and beg, and plead, and pray and it won’t help. You can make promises. Make vows. It won’t help. You can say the sinner’s prayer for the next 10 million years and it won’t work. The false doctrine of annihilation is a lie. The soul never dies. That rich man in Luke 16 is still begging for water. Still begging for mercy. The amazing thing is just how much trouble God went to to keep people out of Hell. No matter what they have done, God doesn’t want them to go there. Jesus died so you and I wouldn’t have to go to this horrible place. There is an alternative to Hell. Those that have not rejected Christ will spend an eternity in Heaven. But the rich man died without God, and in Hell he lifted up his eyes, being in torments. If you go, you will go knowing what lies in store and choosing to reject Jesus Christ. I beg of you today – please don’t go to Hell!